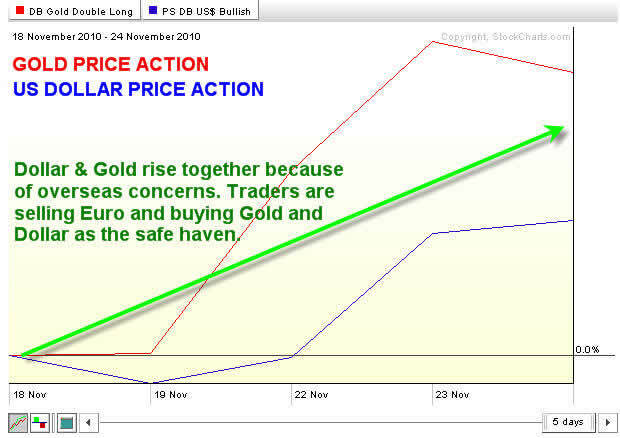 Gold & U.S. Dollar Rise Together? The past week and a half has been as choppy as it gets for the stocks market. Thankfully the herd mentality (fear & greed) stays the same. Understanding what others think and feel when involved in the market is one of the keys to making money consistently from the market. The crazy looking chart below I will admit is a little tough on the eyes, and I should have used red and green for holiday colors but green just was not going to work today so bear with me J. This is a simple chart to read if you understand how to trade these market internal indicators (NYSE volume ratio, NYSE Advance/Decline line, and Total Put/Call ratio). 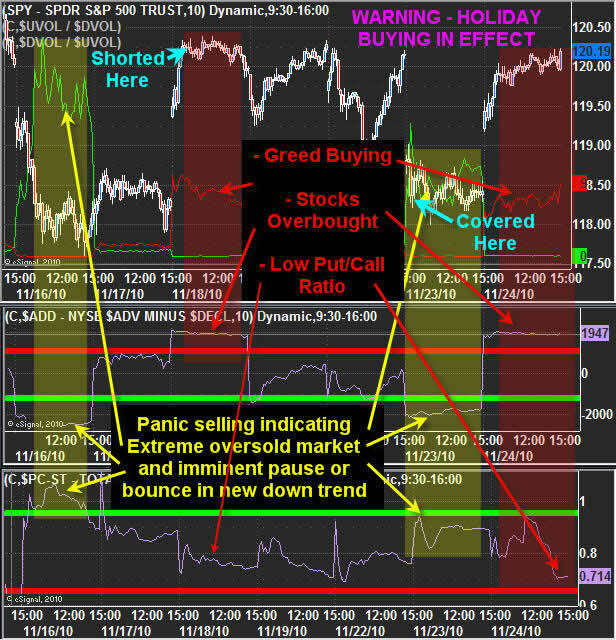 It shows and explains how I get a read on the overbought/sold conditions in the market. There are several other criteria needed to pull this trade off but it is these charts which tell me to start getting ready to take partial profits, buy or take short positions. The top section shows the NYSE volume ratio line. When the green line spikes is means there are more sellers than buyers by a large amount and I call this fear. On the other hand when he red line spikes it shows everyone is chasing the price higher because they can’t stand the thought of missing another rally. I call this greed or panic buying. You buy into fear, sell/short into greed. Rising Dollar & Gold - I Don’t Get It? That is the question everyone seems to be asking this week. I think what we are seeing is straight forward. Traders/investors are selling Euros because of the issues overseas and are buying the dollar along with gold and silver. Generally when the dollar raises gold drops, but they are both moving up in sync, and really I don’t see the problem with this as it has happened many times in the past. Currently I am neutral on gold and silver because of this situation though. I feel something is about to happen in a week or so that will change things in a big way. In short, the equities market is now in a down trend and overbought here. It’s prime for a short position but with the holiday, light volume Friday, and most likely a follow through buying session on Monday I think its best to sit in cash without the stress of wondering what will happen on Monday. Just enjoy the holiday. Recently members had a great short play locking in 2.2% gain on one of our positions this week as we shorted the market using the SDS inverse SP500 ETF. We also continue to hold two other positions with a 22 and 24% gain thus far and I think going into year end things are really going to heat up.